The nose has an important place in the face. 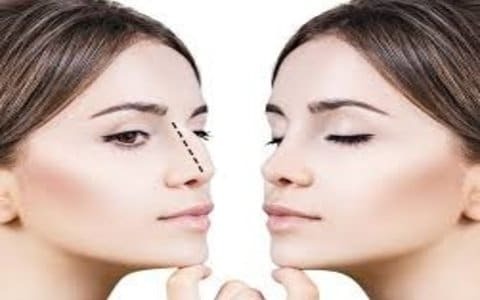 For people who consider it as a handicap, rhinoplasty allows them to change their own ideas about their appearance, and to find that they have a natural nose and not a caricature. Recourse to surgery is not always necessary to correct a fault in nasal shape. Medical rhinoplasty, by using hyaluronic acid injections, can, in many cases, answer patients’ needs. – The nose should represent about 1/5 of the total width, and 1/3 of the length of the face. 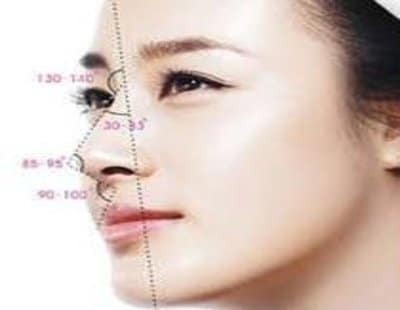 – The intercanthal distance (width of the eye) should be equal to the width of the nose (distance between eyebrows), and the width of the base of the nose should also be equal to this distance. – The distance between the ‘nasal-spine’ and the upper lip must be between 1.8 and 2.8 cm. 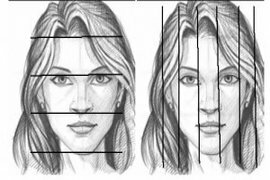 – The line passing through the mid-point of the nasal height and the most forward projecting point of the upper lip must be 3mm in front of the chin. This gives the nasal projection. Flat, thus 180°. it should be convex for men and concave for women. It should be between 80°-95°. This measures the incline of the columella (lower part of the nose) in relation to the upper lip. It should be between 90°-100° for men, and 95°-110° for women. The tip plunges downwards if the angle is small, and is retroussé when it’s more open. It should be between 115°-135° for men, and 120°-125° for women. This is the most important angle for the beauty of the nose/ aesthetics of the nose. If the angle is too open (Grecian nose), the nose seems longer, and if it is too closed, the nose seems shorter. 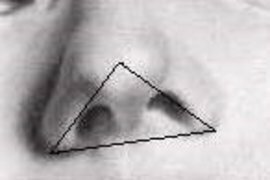 – The base of the nasal pyramid is a triangle where the base is equal to the height (of the nose). – The nostrils have an elongated shape, and the back part is bigger than the front of the nostrils. The axis is oblique towards the front and inside, which gives a sagittal plan angle of 15°, opening towards the back. – The upper limit of the nostrils is at mid-distance between the nasal tip and lobulo-colummella. The shape and orientation of the tip are influenced by the alar cartilage. 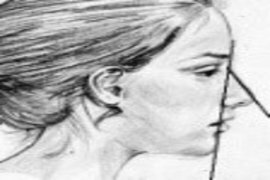 Its movement is influenced by the depressor muscle of the nasal septum, and the lifting muscle shared between the upper lip and the nose. Several rules can be used to calculate the right projection for the tip. The tip’s projection (2 on the picture), defined by the distance between the alogenian groove and the cartilage domes, should be two-thirds of the length of the nose (3 on the picture) and should be double the distance between the nasion (the most recessed part of the dip between the nose and forehead) and the inner canthus (1 on the picture). 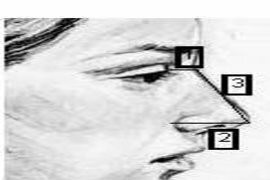 2) The projection is adequate when 50-60% of the tip is in front of the vertical line from the upper lip, and if it is equal to 60-65% of the nose length. 3) Crumley’s triangle rule: the ideal projection allows us to draw a right-angled triangle where the sides respect the 3: 4: 5 ratios of Crumley’s triangle. Rotation is defined by the angle of the naso-labial opening which should be between 90°-100° for men, and 95°-110° for women. For the tip’s rotation-projection, visual illusions should be taken into account: The dorsum’s convexity gives the impression of a plunging tip, even though the naso-labial angle is normal; an exaggeratedly concave dorsum will give the impression of excessive rotation. – Definition rests on characteristics which don’t always fit well together. 1) Visualisation of the cartilaginous alar reliefs when the skin is insufficiently thick to hide them. 2) Subtle depression of the upper-tip, automatization of the tip when its projections goes slightly beyond that of the dorsum. 3) Double lobulo-columella break which makes the apical lobule a clearly distinct element of the columella. The hyaluronic acid used is highly crosslinked type Restylane Perlane or medium reticulated type Restylane. 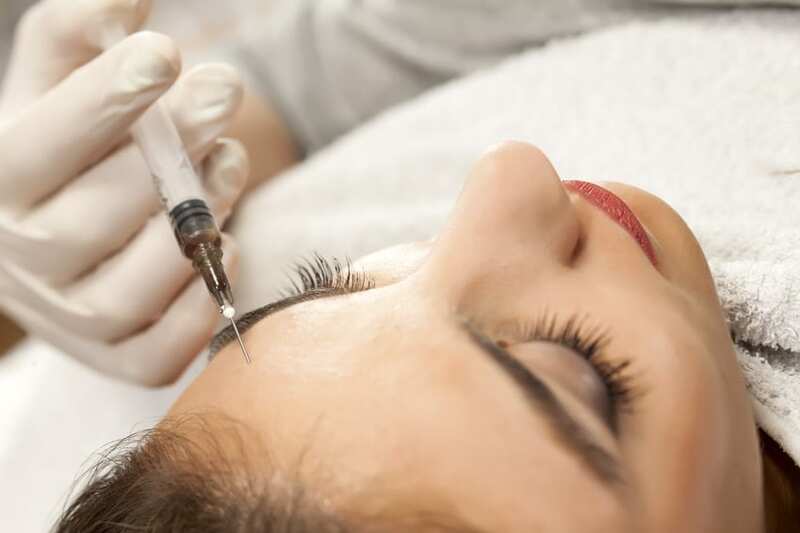 Depending on the indication, the injection will be deep or superficial. – Correction of a plunging nasal tip. 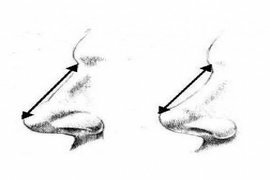 – Correction of anomalies to nasal angles. – Correction of the nasal dorsum. – Correction of post-traumatic or genetic depressions and bony or cartilage bosses. – Erase ala grooves (to the ala at the side of the nose). – Improve definition to the tip. – Correction to age-related changes: thinning of nasal edge cutaneous tissue, closing of the naso-labial angle. – Refinement of the nostrils using tensile threads. – Correction of functional defaults of the nasal valve during inhalation, i.e. the collapse of triangular cartilage on the cartilaginous septum when inhaling. The interest of threads is to lift the tip of the nose and straighten the dorsum. They are used mainly on Asian noses. The Doctor never insists, never pressures you and is always objective. My nose gave me a strict appearance, Doctor Romano gave me a new nose, I’m 100% satisfied. I did a medical rhinoplasty with Dr Romano. Doctor Romano was attentive to my request. I was satisfied with the result : natural, with the disappearing of the lump I had.